The other day, a reader asked me about foundation application in my Facebook group . In this second post of our newly started series, BFE Reader Queries, I shall share some sure-shot tips to avoid patchy foundation and ensure smooth and even application. Question: What should I do to make my foundation look smooth and even ? Whenever I use foundation , it looks uneven and patchy on my skin. Foundation not only helps to make the skin look even but also provides a good base to other makeup products. Foundation, after it's application should look like your skin so that no one can tell if you are wearing any makeup or not. Foundation application is the most important part of makeup and it can make you look your best if applied properly. However, it can ruin your makeup if you don't know the way to get it right. There are following top 5 possible reasons for uneven and patchy looking foundation. Now lets go into the details of each one of these and see what are the possible solutions to deal with these. 1. Your skin is dry and needs moisture: Foundation always looks uneven and blotchy on dry skin. Always moisturize your skin before applying foundation. Oily skin also needs to be moisturised with a light weight, water based moisturiser like Garnier Ultra Lift reviewed on this blog.Water based moisturisers keep the skin hydrated without making it oily. Use a cream or oil based moisturiser for dry skin and a combination of both for combination skin before applying makeup. 2. Exfoliate / Scrub: Exfoliation of scrubbing is an important step of skincare. Scrub once or twice weekly to slough off dead skin that forms patches here and there on your face. Most of the times, hairline ; area around nose and chin look patchy. Foundation sets into the layers of dead skin around these area and looks patchy. Regular scrubbing will cast off these dead skin layers and make your skin smooth so that foundation goes on smoothly. 3. Invest in a good quality foundation: Always buy foundation of a good brand because if foundation is not good, it will not blend properly no matter what you do. Try to buy foundation from offline stores inside of online sites because that way you can always test the foundation on your skin before buying. 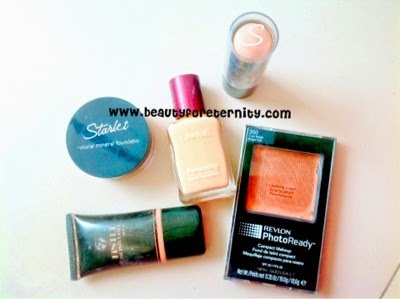 Maybelline, Loreal and Revlon are my most favourite affordable drugstore brands. 4. Choose the foundation according to your skin type: After the brand, second thing that you need to check is type of foundation. A particular brand makes N types of foundations catering to the needs of all types of buyers. But all of those are not equally good for you. Buy water based, light weight, mattifying foundations for oily skin and summer season and cream/oil based, moisturising and dewy foundations for dry skin and winter season. 5. Blend Blend Blend: Blending is the key to makeup. Always work the foundation into your skin so that it looks seamless and even. Use little amount of foundation and blend more. Applying tiny dots all over the face helps in blending because it distributes the product evenly on your entire face. Use a flat top stippling brush, or a damp sponge if you struggle with blending. Use stippling motion rather than sweeping the foundation all over. You can also use your clean fingers to blend the foundation. 1. Mix a drop of olive/almond/bio-oil in the foundation before applying. 2. Use a water based moisturiser under water based foundation and use oil/cream based moisturiser under cream based foundation because 'like dissolves like' so it will help in blending the two together.